Almost never seen on Ebay, the Drake RR3, otherwise known as the R4245, which is also essentially a Drake R7/A inside a marine style case. Click here to view on eBay. Wow–I don’t think I’ve ever seen the Drake RR3/R4245 before. It would certainly be a unique Drake piece to have in the shack. As Dan mentions, the seller does not offer returns, so you would want to thoroughly research the condition prior to bidding. This entry was posted in News, Radios, Shortwave Radio, Vintage Radio and tagged Dan Robinson, Drake R4245, Drake RR3, eBay on May 16, 2016 by Thomas. I happen to have a Drake R4245 for sale in Chile. It is in VG conditions, with no case for it came from a rack. 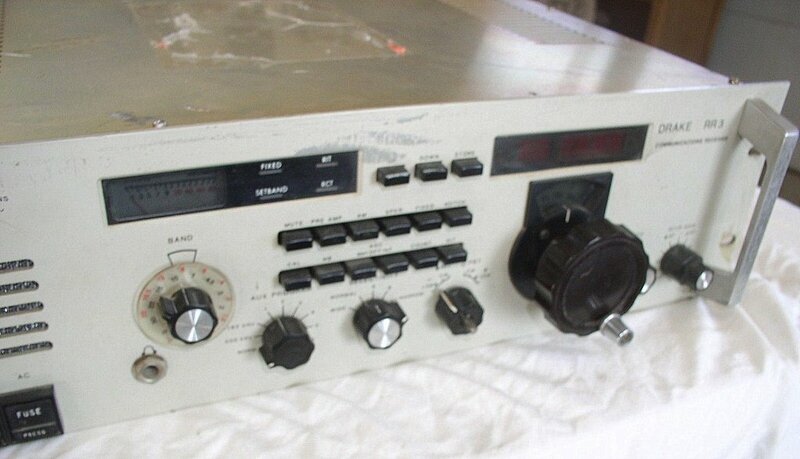 I once owned one of those… it had a sub 1000 serial # ( in the low hundreds as I recall) and came from a ship built in Romania in the early 1980s for Norwegian owners. Was in the discard bin with the rest of the radio room kit when GMDSS was introduced in the mid 90’s. I wish now I had the rest of the radio room gear which probably went to landfill…. although I did get the morse key… an ‘a/s Elektrisk Bureau Oslo’ one which I have before me as I write this. It was the reserve receiver… the primary was a Skanti. I sold my RR3 maybe 10 years ago on Ebay for about $1000 Australian. That ship went to the breakers a few years ago but I saw a sister ship here in Pto Montt a few days ago… I wonder??? She may be worth a visit on her next call? Are you interested in a Drake R4245? Dan is a veritable radio bloodhound! Glad to see he’s enjoying his much deserved retirement. The Drake R4245 shares a mother board with the R7, but the permeability tuned oscillator is replaced by a synthesised local oscillator based on the Drake external VFO. This tunes in 10Hz steps with 100Hz display resoluton, making it fully synthesised and much more stable than the R7.